As you’re likely aware, iTunes 12 brings a lot of changes to Apple’s venerable music/everything-else-in-the-world app and, because of these changes, some people find it frustrating. And a subset of those people find it frustrating because they find its unfamiliar interface a little tricky to navigate. My goal in the next few minutes is to show you how to more easily move around the interface. Let’s start with ripping CDs. When you insert a CD into your media drive (presuming you have one), you’ll be prompted to import the tracks on it. If you click Yes, iTunes will rip the tracks and import them into your iTunes library. But if you choose No, how do you later get back to that CD? Just click on the CD icon in the toolbar. When you do you’ll see the option for importing the CD in the top-right of the tool bar. If you’d like to import just a track or two, select those tracks, right-click on them, and then choose the option to import them. Just those tracks will be imported. It’s also in this view that you can choose to join tracks together as a single track. In this case, select some tracks and from the Options menu choose Join CD Tracks. iTunes 12 has a contextual interface. What I mean by that is that the Music, Movies, and TV Shows buttons do different things depending on where you are in the interface. So, here I am in my iTunes Library, and this is my music. If I then click on the iTunes Store button I’m taken to the music section of the store. When I click on the Movies button, I remain in the store, I’m not taken back to the movies in my library, which is a new behavior in this version of iTunes. In order to get back to your local library, you have to click one of the My links in the toolbar. Then, when you click on one of the media buttons, you’ll navigate only to your local media. If you’d like a shortcut to the iTunes Store, just press Shift-Command-H, which will take you to the store appropriate for the kind of media you’re currently exploring. iTunes 12 also has a new Info window. Similar to Yosemite, the Info window doesn’t make it entirely clear what is and isn’t a menu or editable field. If you hover over something, it’s true nature is revealed, but perhaps you’d rather not bother. If not, close the window, hold down the Option key, right-click on an item, and choose Get Info. The “old fashioned” Info window appears where I can edit just as I used to. Now, about the sidebar. If you’ve been using iTunes for awhile you’re used to seeing a sidebar. It’s not entirely gone, but it too is now contextual. To view it, you must select one of the Playlists entires. When I do that while viewing Music, the sidebar appears along with my playlists. Within this view I can then change how my media appears from the menu on the right. If I want to see all the tracks in my music library, for example, I just choose Songs. Likewise, I can switch to my movie library and then view a movie list. Same idea with TV shows. One nice thing about this is that the view is sticky. When I move between media types, the last view is maintained. 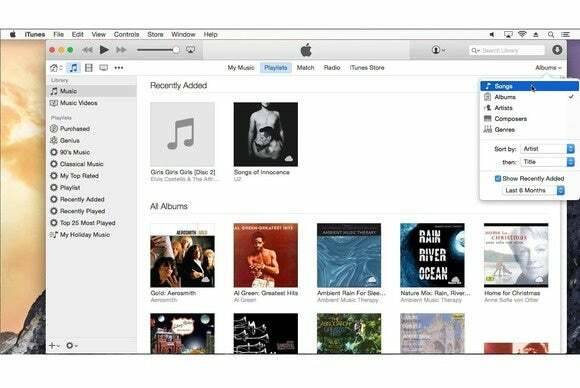 Yes, iTunes 12 is a big change and not everyone is going to like those changes. That said, once you know how to navigate through the interface, those changes aren’t nearly so hard to swallow.